Slightly adapted from Annie's Eats. Happy Monday all! I hope you had a wonderful weekend, we had a fairly relaxing one for a change which was nice. Now I have to be honest, I've been putting off blogging about this recipe for awhile. I've made this at least 3 times since I first saw the post on Annie's site, each time changing it just a little because though I loved it the first time, I just felt like it needed something more. I finally figured out what it needs, a little extra garlic, and little more chipotle! I like my burrito's spicy, I will admit that. But remember we live in the heart of the southwest where food is generally really spicy anyway, so I understand if this is too spicy for most of you. I wasn't formally introduced to the bean burrito til I moved out here to Arizona and married my Hubby. I mean we had the occasional Mexican food growing up, and of course Taco Bell (which even I have come to admit is not real Mexican), but the food was nothing like what we have here. Now at first I will admit to having to adjust, since I can't eat Cilantro, which is prominent in almost all truly authentic Mexican food. And luckily my Hubby's family has been willing to adjust their recipe to leaving it out, or making a small batch without for me and my love for authentic Mexican food has grown tremendously! And though I'm not sure I would classify this a truly authentic, it is absolutely delicious! I was a little worried, since my Husband is pretty picky about his Mexican, but he loves this recipe too! I think it has just the right amount of heat, and I love that it is so low in calories and fat, but is loaded with protein and a ton of flavor. And I have to be honest, I don't always serve it up burrito style, as we have found this makes an amazing bean dip, or tostada topper. This was what we had for my Hubby's Birthday dinner on his actual birthday, and it was delicious! It comes together so quickly which was wonderful since I didn't want to spend the entire day in the kitchen cooking. Enjoy!! In a skillet, heat the oil on medium-high heat. Once hot, add in the garlic, chipotle, and spices cooking until fragrant. About 30-60 seconds. Then add in the water or broth and your drained beans. Bring to a boil, and cook for about 10 minutes. Once the beans have cooked, remove from the heat and add in the salsa and using a potato masher or fork, slightly mash the beans and mix in the salsa. 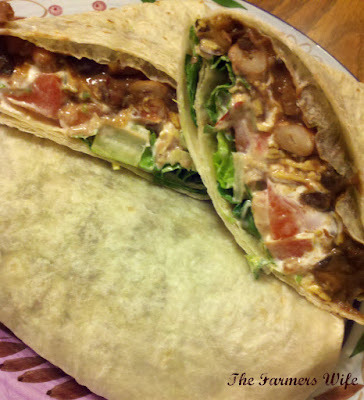 Then serve warm etiher in a burrito with your favorite topping, or as a base for a bean dip or tostada. We really just love this, I think I prefer to eat it as a bean dip personally, but I love dips. haha! I give this 4 stars. That picture looks so good! You know, I don't think I've ever made my own bean burritos. And now that you say it would make a good bean dip, I'm gonna have to make that too...lol. Just looking at the photo makes me hungry. This sounds fantastic. Thanks for sharing. A relaxing weekend? I forget what those are like... it's nice that you got some time to just chill though. I'd love to love spice and high heat foods, but my body hates them! These burritos do look mighty tasty though! You are making me crave burritos! This looks so yummy! That's one yummy looking bean burrito! I'd forgotten about burritos and beans: last time I ate one was a trip to the US 11 yrs ago! Nothing else for it if I can't make it over quick enough to get one! Thanks for making it possible to relive the memories at home! Looks SO good.